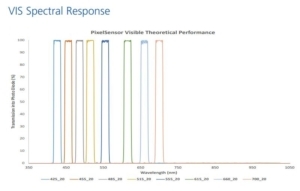 Multispectral sensors (PixelSensor™) use exclusive on-chip filtering to pack up to 8 wavelength-selective photodiodes into a compact 9x9mm array for simple integration into optical devices. 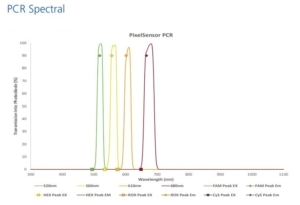 A single multispectral sensor replaces multiple components, helping OEMs shrink multi-wavelength instruments such as in vitro diagnostics, biochemical assays or colorimetry applications. 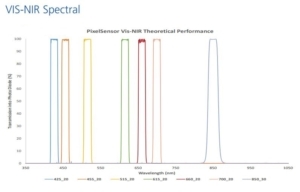 Multispectral sensor’s wafer-level optical filters split the spectrum into 8 discrete color bands and suppress out-of-band background light, improving contrast and sensitivity. 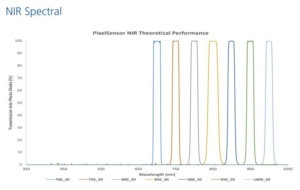 Multispectral sensor offers narrowband selectivity (400-1000 nm), is available in OEM versions with user-defined spectral bands, and can be specified with optional electronics board and accessories for rapid prototyping and development.